Can the New Vespa Scooters Still Pass as Mods? The term ‘Mod’ for a scooterist is associated with the understanding that the scooter being described is modern. That term came into use in the 1960’s. It is an oxymoron to use it now for some one that rides a vintage scooter. It really should be applied to someone that rides a current, modern scooter. Yet a ‘Mod’ is someone that dresses and rides vintage. In the last few years there has been a flood of vintage scooters coming into the country from Asia. Most are from Vietnam and some are from India. A quick look at EBay and there are also listings from Spain. All of this is an attempt to cash in on the ‘Mod’ market. While the idea is all well and good, the quality is poor at best. With the lack of well maintained roads or any roads, the scooters from Vietnam are not recommended. Neither are the ones from India for the same reasons. A quick look at the vintage scooters from Spain, and while their prices are low you will likely have big bodywork bill, as they tend to be battle worn. Naturally, the best scooters are in the hands of private collectors. There has also been a great divide in scooterist culture. The vintage scooterists do not like to ride with owners of newer scooters. 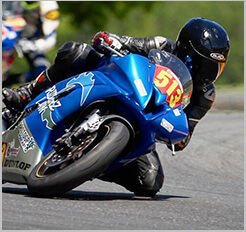 They have even named events “Classic Not Plastic” in an effort to discourage riders of current scooters to attend. 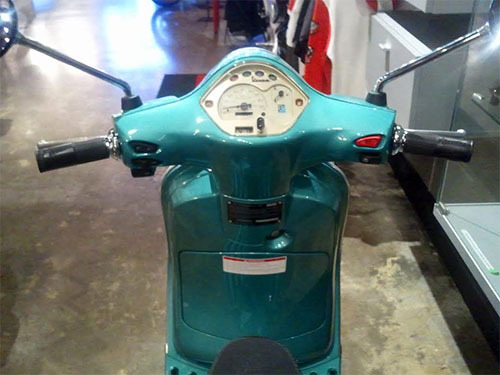 The vintage scooters are manual and you need to put them into gear. The modern scooters are ‘twist and go’ or automatics. This means they can stop on a dime and can charge up a hill with ease. Mixing them becomes havoc when vintage scooterists must break behind them on a rally ride. The rider must now go all the way back to first gear and work back up to third, all the while the twist and go keeps traveling with no concern or consideration for the vintage rider. I’m talking the bottom of a steep incline going to the top of a hill. It seems all rally hosts want to show off the hills in their cities. 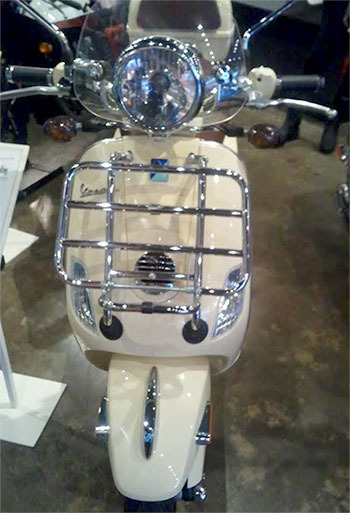 Vespa addressed the debate by releasing a new handmade scooter that upholds the classic metal bodywork. 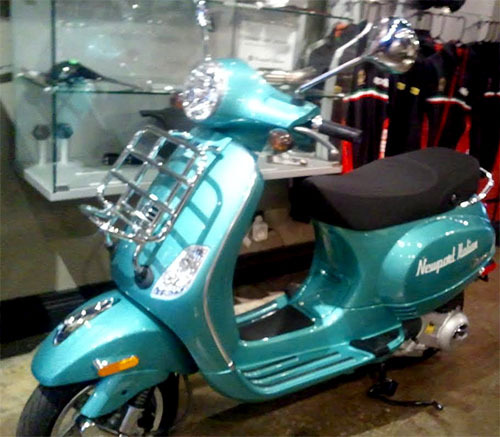 Only 250 of the Vespa 946's came to the states, at least one being still available in Newport, California. It should get about 124 miles to the gallon and at a cost of $10,000.00 it won’t break the bank. This makes it possible to be a modern scooter owner with a metal-bodied steed. If none of this is your concern and you are a young professional that needs to save money (with college tuitions what they are, who wouldn’t)? 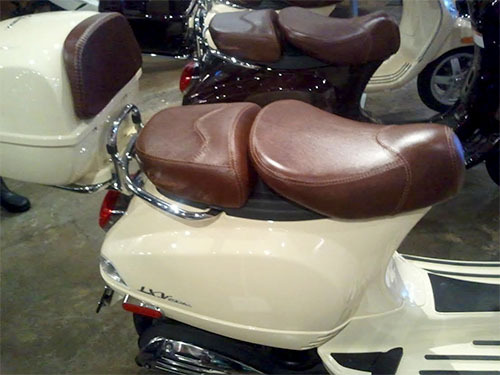 then the rest of the Vespa line might interest you as well. The LX150 ie is a four stroke engine and gets about 100 miles per gallon. Shown here in Aquamarine and sold at about $4,500.00. Another is the GTV 300ie. This is a bit bigger than the 150, shown below in beige. The ride is very comfortable. The price tag it about $7,199.00. It is a bit more lux than the LX150 and it shows. This also gets about 100 miles per gallon. 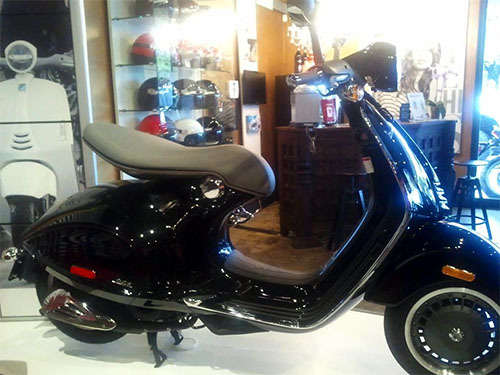 This is still a great stylish scooter, but is it ‘Mod’? With some front racks and mirrors added? The answer is no. Only vintage scooters are ‘Mod’. Will people in the scooter community accept a modern twist and go that is metal? They may buy one, but maybe not take it to a vintage scooter rally. To the die-hard’s this all matters. But if you want a reliable scooter, you gotta get a new one.